Wausau Window and Wall Systems' employees celebrated the company's 60th anniversary with events recognizing past contributions and a commitment to future growth. A group photo commemorated the milestone with associates wearing shirts that say, "Proud past.... Bright future. Great people... Great products." 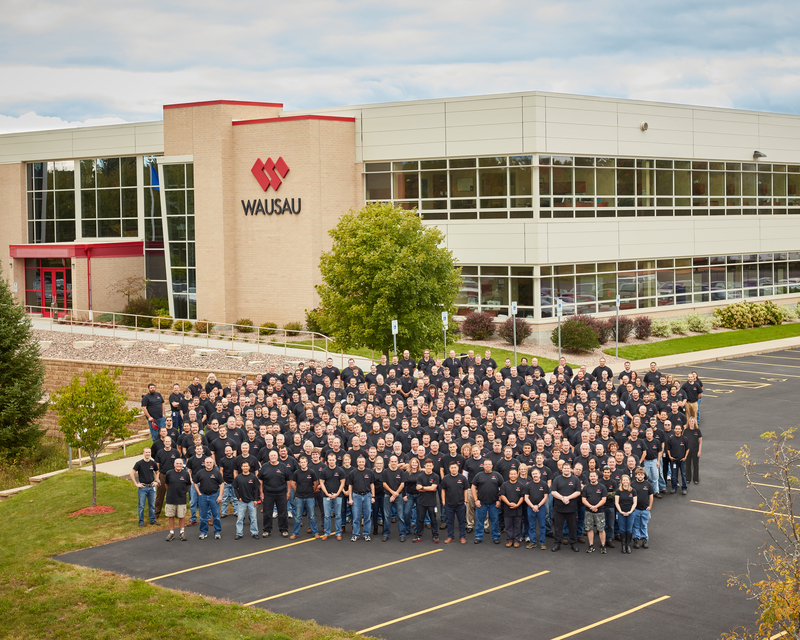 "More than a slogan, we're proud that many of our customer and employee relationships go back for decades and generations," says Jim Waldron, Wausau's president. "We believe that our 60 years in business is due in large part to our dedicated and talented team focused on delivering best-of-class products and service to our customers." Founded in 1956 in Wausau, Wisconsin, the company engineers and fabricates window and curtainwall systems for commercial and institutional buildings. Wausau is one of the architectural businesses of Apogee Enterprises, Inc. (Nasdaq:APOG), a public company that provides distinctive solutions for enclosing commercial buildings and framing art. "Supported with the financial strength and stability of our parent company, we have effectively managed our success through economic recession and recovery. We honor our commitments, continually invest in improvements and innovations, and enjoy a solid history of safety, corporate citizenship, industry leadership and positive growth," adds Waldron. "As a growth-oriented business, we are strategically aligning our culture, processes and metrics. Looking ahead, we are on track to double the size of our business over five years. We are in the third year of our five-year journey to reach this goal." "Before our new fiscal year begins in March, we plan to hire 30-35 people, joining our current 485 associates. We are actively seeking the right candidates in engineering, estimating, sales, operations, leadership and production," says Maureen Egan, Wausau's vice president of human resources. "Our people are critical to our growth strategy, and Wausau is committed to investing in developing and retaining our talented team." 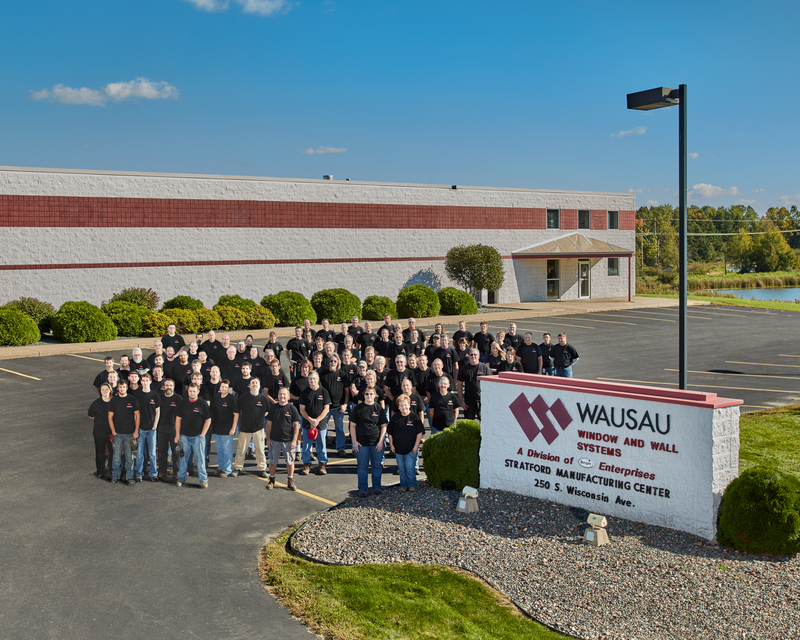 In addition to Wausau's experienced staff, other keys to the company's ongoing growth and success during the last 10 years include its state-of-the-art manufacturing center, new product and technology developments, continuous improvement initiatives, and investment in employee training. * Opened in 2008, Wausau's manufacturing facility was designed, constructed and certified to meet U.S. Green Building Council's LEED® Silver rating. Supporting building projects' environmental and sustainability goals, Wausau has decades of experience in developing window and curtainwall products for energy efficiency, durability, daylight and views. Since 2010, its aluminum products have been offered with high percentage of recycled material and no-VOC finishes. * The INvent™ Series of projected windows was introduced in 2010 as part of a pre-engineered, competitively priced product offering available on an accelerated delivery schedule. In 2013, the INvision™ Series product family of factory-glazed, unitized curtainwall and window wall systems also was added to the pre-engineered product offering. In 2016, Wausau also expanded its 3-D BIM tools to feature the INvision product family with an all-in-one unitized curtainwall Revit® project file. Wausau's facility in Stratford, Wisconsin, fabricates many of these products and will celebrate 20 years of operation in 2017. * Wausau further expanded its product offering in 2013 with the Custom Window™ by Wausau brand of historically accurate, aluminum windows. Helping new employees maintain the company's high standards for these and other products, a production training laboratory opened at Wausau in 2016. As part of the company's continuous improvement efforts, the training program is followed by ongoing mentoring and continuing development. "All of Wausau's product offering is supported with our high level of customer service, experienced engineering and design teams, dependable schedules, on-time shipping and industry-leading warranties," emphasizes Waldron. "As part of the building team, we help realize the vision for each project's performance requirements, attractive appearance, sustainability and lasting value." To learn more about Wausau Window and Wall Systems, please visit www.wausauwindow.com. For information on career opportunities at Wausau, please click on "Careers" at the top of the home page.